Please fill out the “Bookings” form at the bottom of this page. Join us for the launch of a newly revised translation of Bulgakov’s classic novel. Foreword author Boris Fishman will discuss the 50th anniversary edition of this seminal work with authors Darin Strauss, Masha Gessen and Liesl Schillinger. The event is also 12 days prior to Bulgakov’s 125th birthday! Celebrate the 125th anniversary of Mikhail Bulgakov’s birth on May 15 with Penguin Classics’ 50th-anniversary edition of his masterpiece, The Master and Margarita, a novel that has been championed by a dizzying array of cultural icons, among them David Bowie, Patti Smith, Mick Jagger, Salman Rushdie, Paul Giamatti, and Daniel Radcliffe. The Penguin Classics edition is the acclaimed, newly revised translation by the premiere translators of Russian, Richard Pevear and Larissa Volokhonsky, and it features a passionate new foreword by Soviet-born, NYC-based novelist and critic Boris Fishman and specially-commissioned cover art by painter and tattoo artist Christopher Conn Askew. On a spring afternoon, the Devil arrives in Moscow, igniting Bulgakov’s fantastical and funny novel. 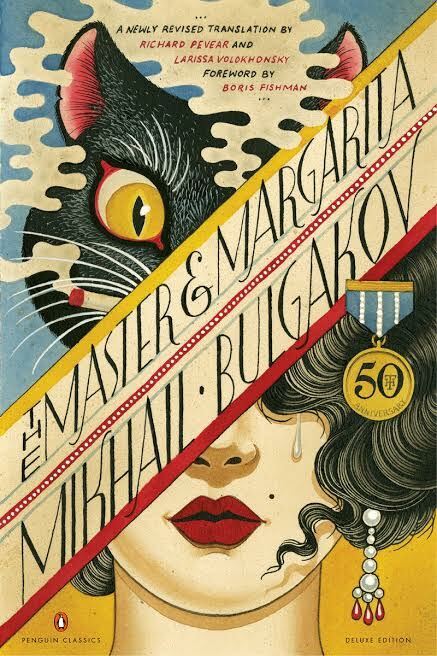 A devastating satire of Soviet life, The Master and Margarita combines two distinct yet interwoven parts, one set in contemporary Moscow, the other in ancient Jerusalem, each brimming with historical, imaginary, frightful, and wonderful characters. Written during the darkest days of Stalin’s reign, and finally published in 1966, twenty-five years after its author’s death, it became a literary phenomenon, signaling artistic and spiritual freedom for Russians everywhere—and containing eerie resonances with contemporary Russia. Mikhail Bulgakov (1891–1940) was a doctor, a novelist, a playwright, a short-story writer, and the assistant director of the Moscow Arts Theater. His body of work includes The White Guard, The Fatal Eggs, Heart of a Dog, and his masterpiece, The Master and Margarita, published more than twenty-five years after his death and cited as an inspiration for Salman Rushdie’s The Satanic Verses. Boris Fishman (foreword) is the author of two novels, A Replacement Life, which was one of The New York Times’ 100 Notable Books of 2014 and won the VCU Cabell First Novelist Award and the American Library Association’s Sophie Brody Medal, and Don’t Let My Baby Do Rodeo (2016). His journalism, essays, and criticism have appeared in The New Yorker, The New York Times Magazine, the London Review of Books, The Wall Street Journal, and other publications. Fishman has taught at Princeton University and New York University. Born in Minsk, Belarus, he moved to the United States at age nine and now lives in New York. Darin Strauss is the author of the international bestseller Chang and Eng, and the New York Times Notable Book The Real McCoy, one of the New York Public Library’s “25 Books to Remember of 2002,” the novel More Than it Hurts You and most recently a memoir Half a Life, winner of the National Book Critics Circle Award. Darin was awarded a 2006 Guggenheim Fellowship in fiction writing. Masha Gessen is a Russian and American journalist. She is the author of seven books, including The Man Without a Face: The Unlikely Rise of Vladimir Putin and, most recently, The Brothers: The Road to an American Tragedy. She is currently a Carnegie Millennial Fellow. Liesl Schillinger is a New York–based journalist, literary critic and translator. She studied literature at Yale, then moved to New York City, where she has lived ever since. She worked at The New Yorker for more than a decade and has been a regular reviewer for The New York Times Book Review since 2004. Her writing has appeared in The New Yorker, The New York Times, The Wall Street Journal, Vogue, Foreign Policy and many other publications; and she is the author of Wordbirds, an illustrated lexicon of 21st century neologisms; and the translator of two novels,The Lady of the Camellias, and Every Day, Every Hour.